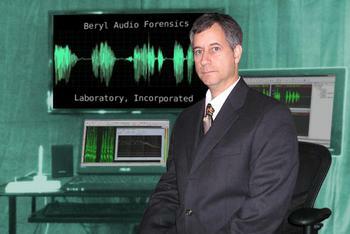 * Beryl Audio Forensics Laboratory, Inc., provides objective technical analysis and enhancement of recorded audio evidence. BAFL has thirty two years of technical audio expertise combined with the latest hardware, software and proper certification to qualify as an objective resource for identifying and exposing recorded audio data and effectively presenting your recorded evidence at hearings, depositions and in any court of law. * Beryl Audio Forensics Laboratory, Inc. has enhanced and analyzed audio from The United States Department of Justice, The Royal Canadian Mounted Police (Canada's equivalent to the F.B.I.,) Esurance, The Hindustan Times and many other. * Your recorded audio can be used to determine the authenticity of fact once recorded voices are analyzed or enhanced. * Often, recordings are made in uncontrolled environments, creating a recording that is difficult or impossible to understand. Using state-of-the-art software, recorded evidence can be analyzed, enhanced, transcribed and presented as legal evidence. Recordings can be made using analog or digital recording devices, hidden or exposed, or made with land lines or cellular telephones. All of these recordings can be analyzed or enhanced. * Audio recordings can be altered (or edited) to influence a legal decision. This editing technique can be exposed thus rendering a recording invalid as a legal document. * Recorded voices can be analyzed to determine a litigant's presence or absence during a recording. * Audio recordings contain data or signals that once exposed can be used to determine the date and time of a recording. * An initial evaluation can be requested to determine the suitability of an audio recording for clarification or analysis. There is a fee for this service and is deductable if the project is completed. Contact Beryl Audio Forensics Laboratory, Inc., by completing the requested information on the contact page. * CV and Rate card are available upon request.